This all-encompassing Program Resource DVD including an In-Service and Awareness Video, and Program Director's Manual. It provides valuable information to increase awareness and ways Be My Disciples can meet parish or school catechetical needs. 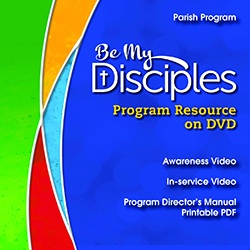 The In-Service Video explains the balanced approach utilized by Be My Disciples, with a demonstration lesson that invites children to discover the message of discipleship and challenges them to make a faith choice. This video will assist catechists in knowing how to plan, teach, and assess a lesson.